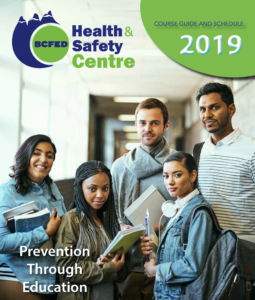 All courses around the province are listed in the 2019 course guide and schedule. Online registration is now open. Remember to register early to guarantee your seat. The year at a glance calendar shows every course with its date and location in BC. The BCFED Health & Safety Centre is offering certificate programs combining several of our most popular courses at our OH&S Summer School in Whistler, BC, in June. Participants completing the program will receive a Certificate in OH&S Fundamentals. OH&S Committee Members, Co-Chairs, Safety Coordinators, Supervisors and Managers are all encouraged to attend. This is a great opportunity to take many of our eight-hour courses in a compressed time frame and get your skills up to speed quickly. Registration fee for each week is $850 per person. Please note our cancellation policy is more than 1 week notice in advance. Current research confirms that mental health issues are prevalent in BC workplaces. Workers who experience mental health issues face incredible challenges in the workplace. Many are misunderstood, stigmatized, and under-utilized. From an organizational effectiveness and sustainability perspective, this is a significant business issue and one that requires attention. In a world where shortages of critical skills are, and will continue to be, a priority for many organizations, we cannot afford to allow the situation to continue. Workplace stress, bullying, harassment, and violence are increasingly the predominant issue for Canadians. Awareness of the staggering economic cost of workplace stress and related issues ($51 billion annually) grows steadily. Research also points to stress as a contributing factor in actual workplace accidents, injuries, and violence, making it a major factor in OH&S. This course looks at all of the various workplace psycho­social factors and works on developing and implementing an effective plan that will improve the psychological health and safety of a workplace. The course examines strategies that eliminate, minimize, and accommodate psychological health issues. Workplace bullying and harassment can compromise the mental and physical health of workers. 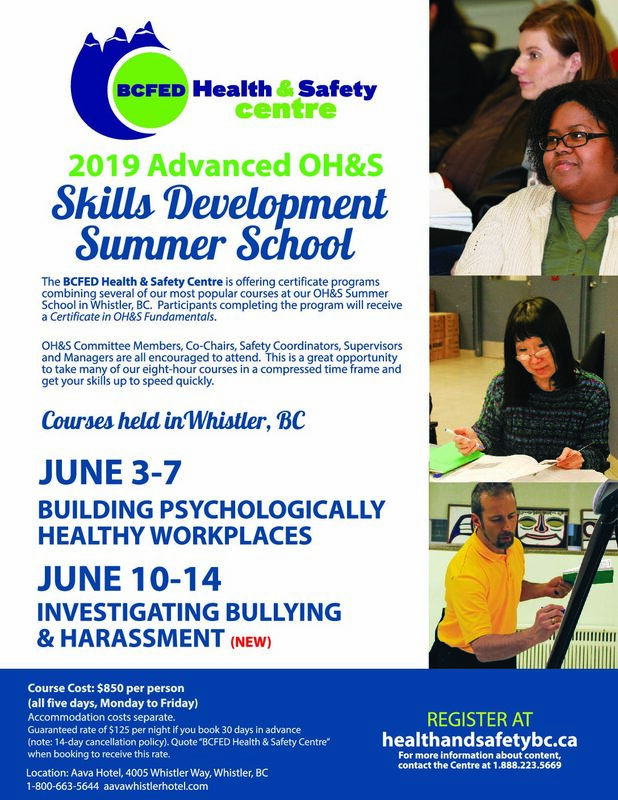 To address this health and safety issue, this course will equip participants with the knowledge and confidence to undertake thorough and impartial investigations into allegations of workplace bullying and harassment as defined in health and safety law and policy. Participants' skills will be developed and practiced through role play in planning, research, interviewing techniques, and analysis in order to conduct impartial investigations. Particular attention will be paid to the emotional and sensitive effect that alleged bullying and harassment has on the workplace. Thorough and impartial investigations are necessary to not only resolve the complaint, but also to educate and ensure proper recommendations follow to prevent further incidents from happening. 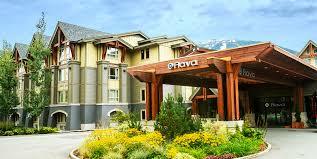 Accommodation costs are separate from registration fees. Guaranteed rate of $125 per night if you book 30 days in advance. Quote "BCFED Health & Safety Centre" when calling to book to receive this rate. When booking a room online, use the 'Group Attendee' code BCFED1 for the first week and BCFED2 for the second week to receive the discount rate. Please note the hotel's 14-day cancellation policy.